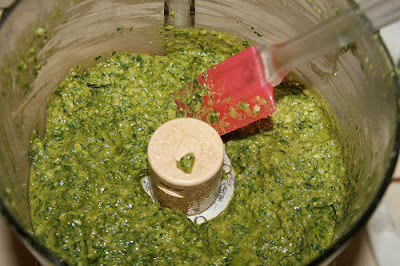 To go with the post I wrote Wednesday on Basil, here is another basic recipe, this time for Pesto. I have covered this briefly in my post on Basic Salad Dressings, but since Pesto is so much more than a salad dressing, I think it's worth mentioning again. 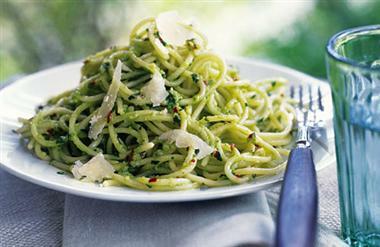 You can now find recipes for pesto made with walnuts instead of pine nuts and with spinach or parsley instead of basil. These are all tasty in their own way, but I don't think anything can beat the taste of pure old fashioned pesto made with the same ingredients that have been used for decades. I do however make one concession. 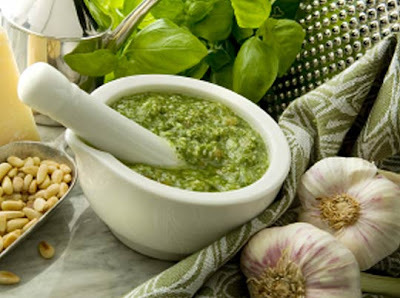 Italian housewives made pesto with a mortar and pestle - a very long and arduous process which we these days can do away with. The modern food processor will make you a batch of pesto in a fraction of the time and with much less effort on your part, and it will be just as tasty. 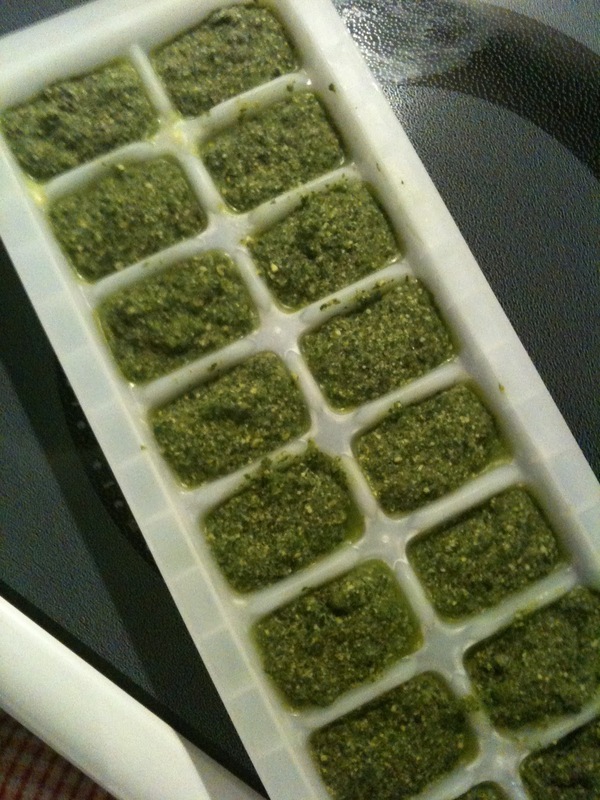 In the summer when basil is prolific, make up a few batches of pesto and freeze it in ice cube trays, then pop the cubes into a Ziplock bag and throw it into your freezer. In the winter when fresh tasting vegetables are at a premium, you will really appreciate having stocked up on this basic. 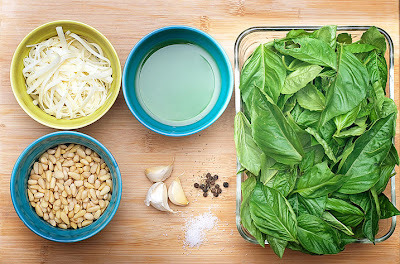 - Combine the basil with the pine nuts and pulse a few times in your food processor. - Add the garlic and pulse a few times more. - Slowly add the olive oil while running your processor. 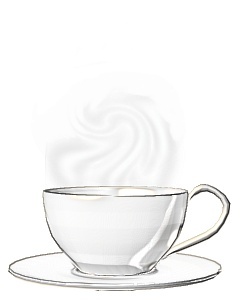 Stop to scrape down the sides when needed. - Add the grated cheese, salt and pepper and pulse again until blended. Once you have your pesto what do you do with it? Lots of things. I have already shown you the traditional Italian Caprese salad which is just sliced tomatoes, sliced mozzarella cheese, and a topping of pesto. This is best made when tomatoes are in season. I always keep bags of Miracle noodles on hand for a quick delicious dinner of noodles tossed with pesto and topped with more freshly grated Parmesan cheese and pine nuts. 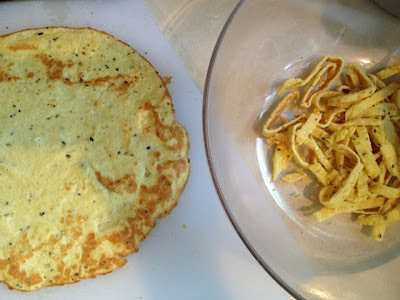 You could also use egg crepe noodles if you want a higher protein meal. Unlike just eating regular pasta, this is a really filling meal because of all the protein in the eggs. Follow the directions for egg crepe noodles . When incorporating the coconut flour and parmesan, I find a whisk the best, and I add a sifted tablespoon at a time. This way there are no lumps. 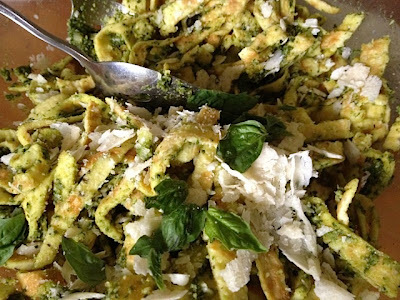 I toss the egg noodles with pesto, top with chopped basil and parmesan shavings and a few pine nuts pan fried in a bit of olive oil. This makes an amazingly filling protein rich economical main meal, and because pesto is so rich and flavourful you won't notice any eggy taste in the noodles. If pine nuts are expensive in your area, walnuts can be substituted. 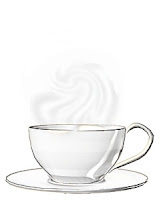 The flavour will be slightly different, but it will still be delicious. 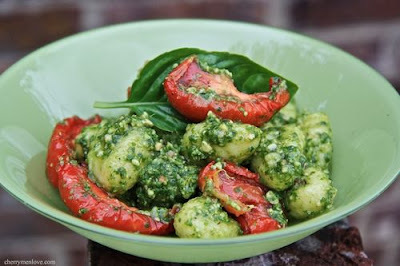 is of course fabulous with my gnocchi as well. 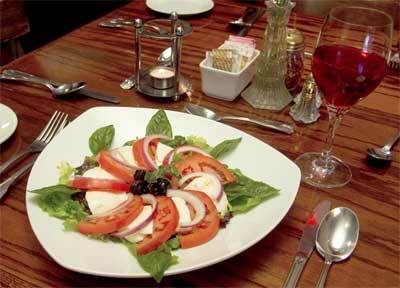 Fresh or oven roasted tomatoes are also a great addition to this dish. Pesto makes a terrific shrimp pizza. 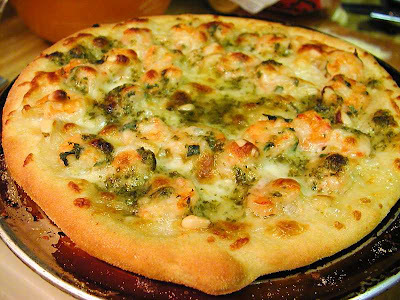 Just top my coconut flour pizza crust with some grated mozzarella or goat's cheese, and shrimps tossed in pesto. You can also sprinkle with a few pine nuts for crunch. 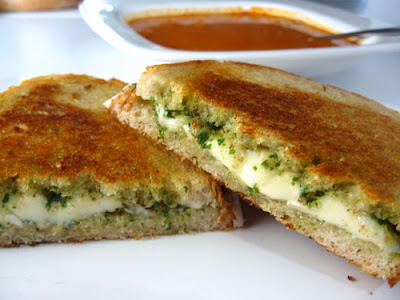 And lastly, here is a great treat to make for lunch one day when you are missing grilled cheese sandwiches. 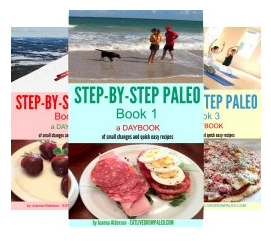 The picture and recipe are from www.macheesmo.com Of course my version is slightly different to make it Paleo, but just as delicious. Butter two slices of Paleo bread, thinly sliced. Lay one slice in a small frying pan, buttered side down. Top with sliced Brie and pesto sauce. Top with the other slice, butter side out. Fry until golden, then turn and fry the other side. Remove from the pan, and try not to burn yourself eating this too quickly. 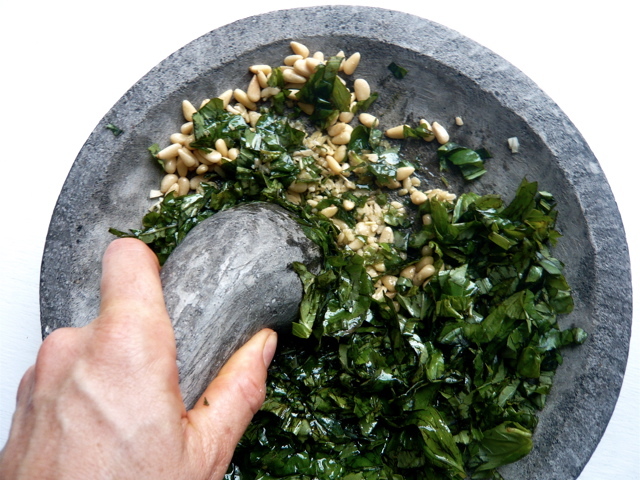 If you feel like trying the old fashioned method of making pesto, as they do at www.coconutandquinoa.com, you can follow their directions ..... which are a lot simpler to read than to do. However you decide to make it, keeping a supply of pesto in your freezer will always serve you well, and remind you of sunny summer days every time you eat it.